Castile soap made from pure olive oil. A natural, vegan soap bar with plastic-free packaging. Castile soap made from pure olive oil is a unique soap that cleans effectively without being too harsh on skin and produces a velvety lather that leaves the skin silky smooth and refreshed. Rose essential oil has been added to this soap, for its divine fragrance but also it's antibacterial properties. Along with the addition of pink rose clay, this soap is one of the most gentle luxurious skin cleansers in the world! 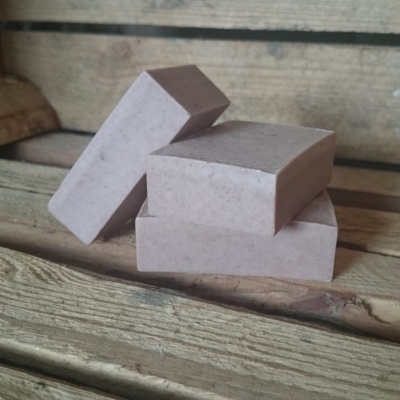 + SUPERFINE PINK FRENCH CLAY is the most mildest of all the clays and is suitable for all skin types especially sensitive skin. It gently detoxifies skin by removing dead skin cells and is great at treating acne prone skin. GREAT FOR: Soothing & Balancing. Suitable for troubled, sensitive, eczema/psoriasis prone or unbalanced skin. Can also be used as a soap/shampoo for babies or for fine hair. INGREDIENTS: Olea Europaea (olive) fruit oil, Organic Sapindus Mukorossi (soapnut) fruit extract, Sodium hydroxide*, Kaolin (and) Illite (and) Red Iron Oxides, Rosa damascena (Rose) Oil, Pelargonium graveolens (rose geranium) oil, Rosa damascena (Rose) Petals. Geraniol**, Citronellol**. *After the saponification process no sodium hydroxide remains. **Occurs naturally in essential oils.